Last month’s panel discussion on mentoring/discipleship was greatly appreciated! Thank you to our panel guests for sharing your hearts and experience. Jesus said that one of the characteristics of His followers was that they visited and cared for those in prison. How can we do that today? On April 17 we’ll have a panel discussion, consisting of those who are, or who have been, active in prison ministry. They’ll share some of what they do, as well as how we can partner with them in ministering to those who are incarcerated. Bring a friend in vocational ministry. First time guests are treated to a free lunch! Even if you’ve been away from SEMF for awhile, we’d love to see you here. You’re always welcome! Tuesday, April 17 — 12:00 noon – 1:30 p.m. Please RSVP by Friday, April 13 so that we have appropriate food from caterer for our group. Don’t forget to sign-up for next month’s World Vision Pastors’ & Ministry Leaders’ Forum. This meeting will take the place of our regular May SEMF meeting. See information and sign-up link below. I hope this invitation finds you well and with church life and ministry thriving. I encourage you to set apart time in your calendar for this gathering as it is one of the tangible ways we can make manifest the unity Christ prayed for before going to face the cross.I encourage you to forward this invitation to other pastors and Christian ministry leaders in the city. If you plan to attend please RSVP to semfellowship@gmail.com by Feb 19th. Also, please have a look at our ‘save the date’ announcement below as well as the attached document. I look forward to see many of you on the 20th of February. 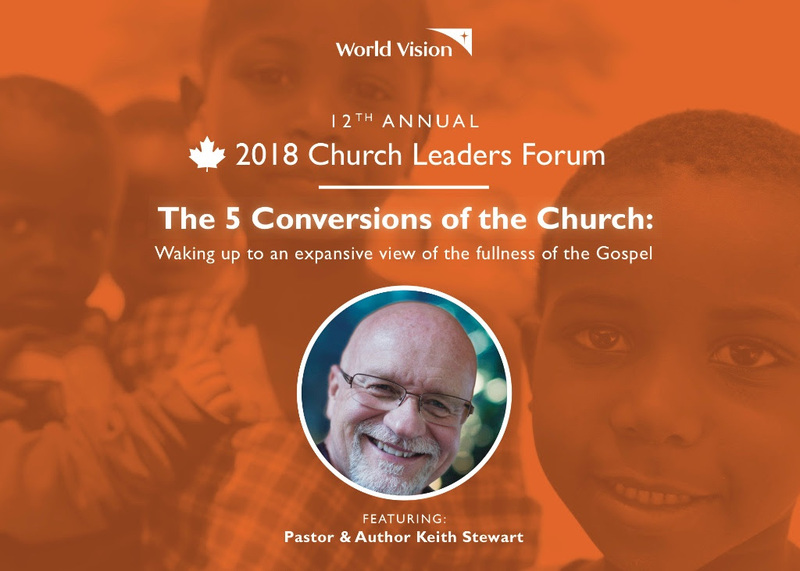 SAVE THE DATE: World Vision’s “Church Leaders’ Forum” is coming back to Ebenezer Baptist Church the morning of Wednesday, May 2. Keith Stewart from Springcreek Church in Garland, TX will be facilitating discussions on justice and outreach. Please stay tuned for more details. Hi there! I’m not about long invitation letters for already established meetings but I ask that you would take a moment to read this one. As we enter the year 2018 a.d I am reminded of that God is all about new life and new beginnings. It is fitting that the Church celebrates Epiphany after Christmas because by Christ’s birth into the world we are able to be re-born by water and by Spirit as well. As part of His body we are made a new creation. I depend on the possibility of new beginnings. Often I get stuck in a rut and have a hard time seeing new horizons or new opportunity. Sometimes I see the opportunity and have the vision but have a hard time doing the work of following through. Other times I have vision and I do the work but then I do it in the wrong way so I don’t get the anticipated result. I am in need of forgiveness, new chances and new life. I believe we all are. This year, many of us will come together to pray at the Prayer Summit Jan 29th – Feb 1st. I believe that the Church in Saskatoon are in need of new life and new beginnings as well and that that will only become possible if we seek that together. The world will get to know Jesus and the new life that He has in store for everyone when we love one another. At the January SEMF meeting we will cover this Summit and the year ahead in prayer. If you are not able to participate in the Prayer Summit, this is a good opportunity to come together in prayer. The meeting will be hosted by the Rock Church (http://therockchurchsaskatoon.ca) so it is a good opportunity to look at their renovated facilities as well. I hope to see you there. Once again we find ourselves in the season of Advent. A time of waiting, expectation and attentiveness. We are waiting with attentiveness because He Who is able to adjust our expectations and fulfill them in His good time is about to become incarnate. Christ, the Saviour of the world is about to be born. The whole universe is taking a deep breath in anticipation for the jubilant proclamation of the good news that He is about to make possible. The whole world is preparing to welcome Him, the Word Who spoke it into existence out of nothing. We invite you and your spouse to join with the angels, wise men and shepherds who left their homes to come out and celebrate His birth at our annual Christmas luncheon. A great Christmas meal will be prepared, we will sing the jubilant songs of Christmas and we will have some games and fun ready. Please join us as we come together as His body to celebrate His birth. If you would like to participate in the 2018 Saskatoon Prayer Summit for pastors and ministry leaders please send your RSVP to semfellowship@gmail.com. Eric will serve as one of our facilitators for the upcoming Pastors’ and Ministry Leaders’ Prayer Summit January 29 – February 1. Eric is a gifted communicator and shares from the overflow of his relationship with the Lord and rich ministry experiences. Eric and his wife Marion, have a deep love for the local church and for Christian unity. While living in Saskatoon, Eric played a vital part in bringing the first Canadian Prayer Summit to Saskatoon. Eric continued to provide leadership in the Saskatoon Prayer Summit, as well as serving as a key leader in Sonday 2000 (City-wide joint service at Saskplace on the first Sunday of the new millennium. More than 12,000 people participated on that Sunday service). Eric has served the Navigators of Canada ministry on local university campuses, as well as on the provincial and eventually national level as director. Eric and Marion model incarnational evangelism and discipleship and continue to invest in lives around the world. Eric has also served in leadership roles in the Canadian Hemophilia Society, including serving as national president. We are glad and thankful to have him with us to share his heart. Reminder: On November 4th please join us in an evening of Prayer for the Summit at the Bridge Fellowship Centre at 7-9pm. If you can’t make it there we look forward to seeing you on November 21st! – Please RSVP to semfellowship@gmail.com before November 17th to reserve your space and so that we can prepare adequate lunch (Cost: $10 per person). – You will be able to register for the summit at this SEMF meeting.